All lanes of traffic halted. I glanced at the dashboard clock. I was teetering on late for an ovarian cancer presentation to medical students. To make better time, I veered off, snaking around Observatory Drive. 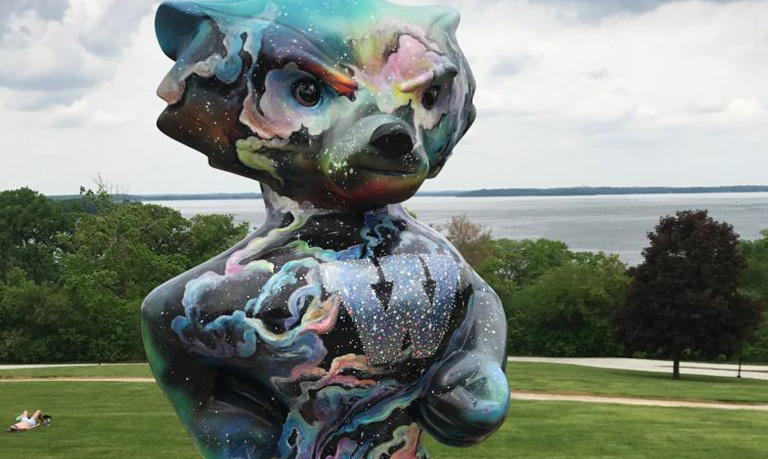 To my right, I spotted Bucky Badger, the UW mascot, overlooking Lake Mendota. Despite my time crunch, I hopped out for a closer look. 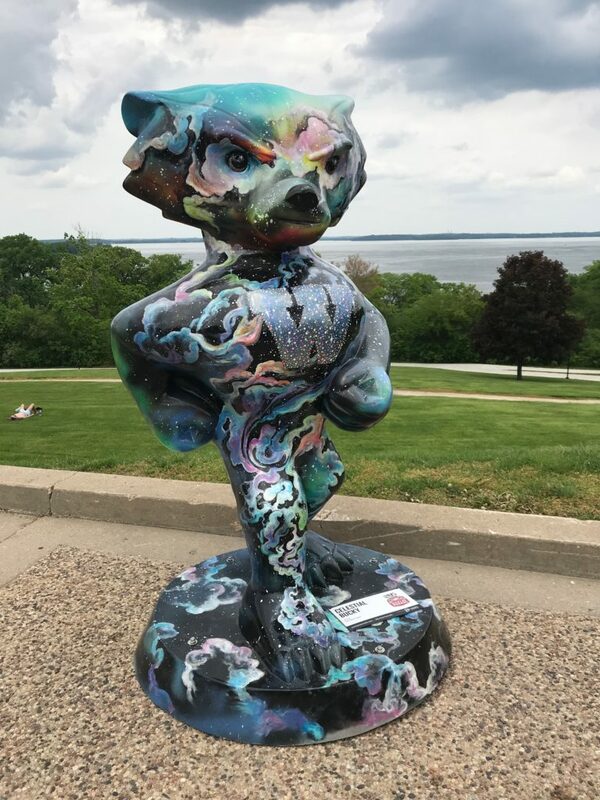 Swirls of glow-in-the-dark paint coated a Bucky titled “Celestial Bucky”— my introduction to Bucky on Parade. 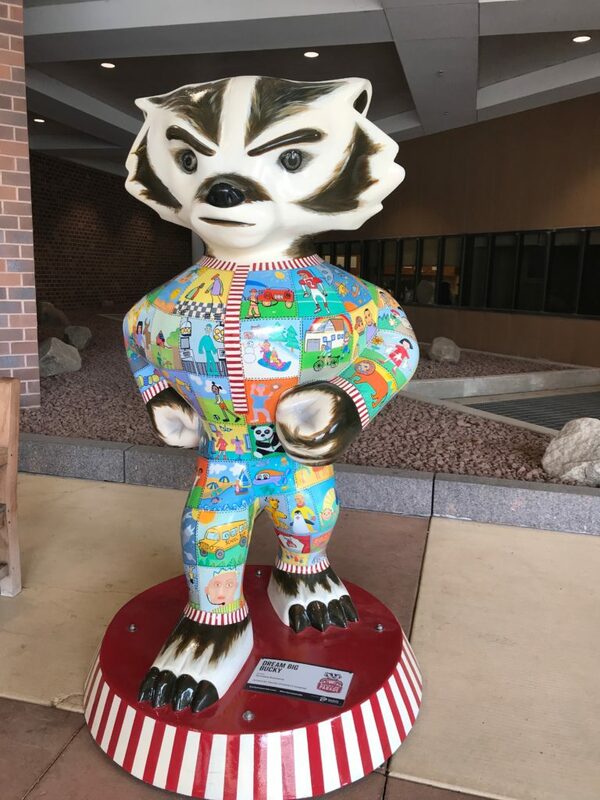 After our presentation, we gathered around “Dream Bucky” encircled with drawings created by children at The American Family Children’s Hospital, representing their hopes and dreams. 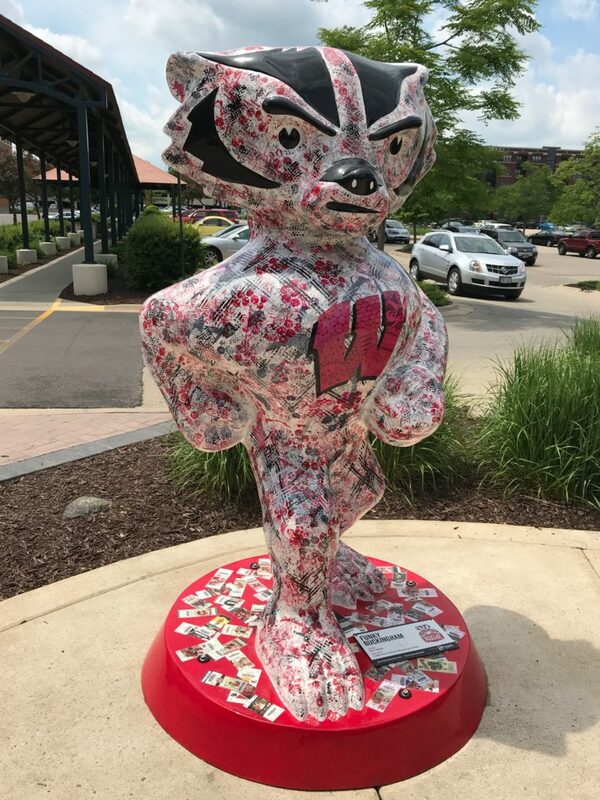 I had inadvertently stumbled upon Bucky On Parade, a total of 85 Buckys created by various local artists. 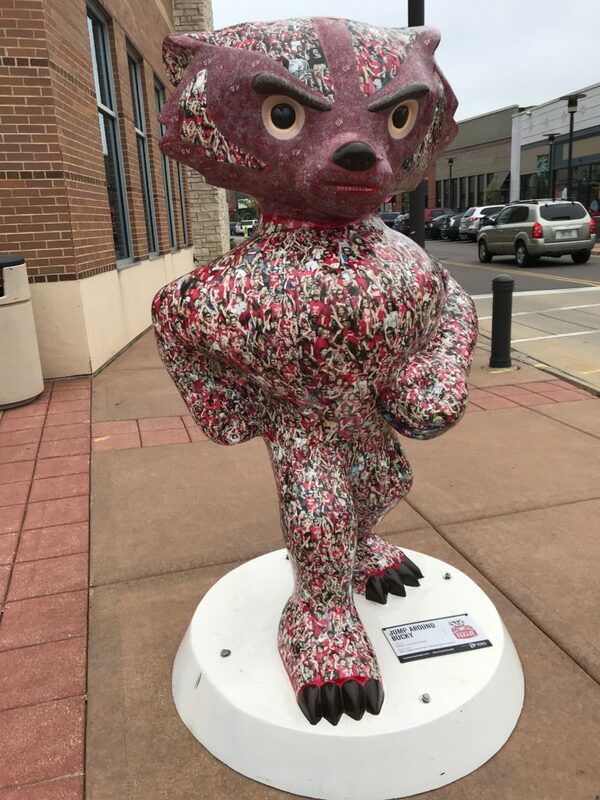 For four months the Buckys would be displayed around the city and afterward many would be auctioned off for charity. 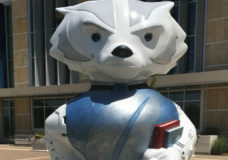 From this point on, my vehicle automatically diverted to Bucky sightings. 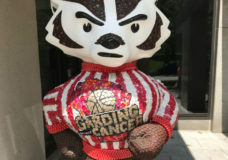 My car had caught the Bucky Bug. 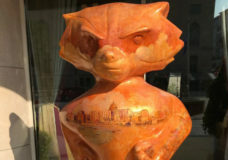 A Facebook post clued me into my next Bucky sighting. “Funky Buckingham” is stamped with patterns created by household items such as potato mashers and bubble wrap. 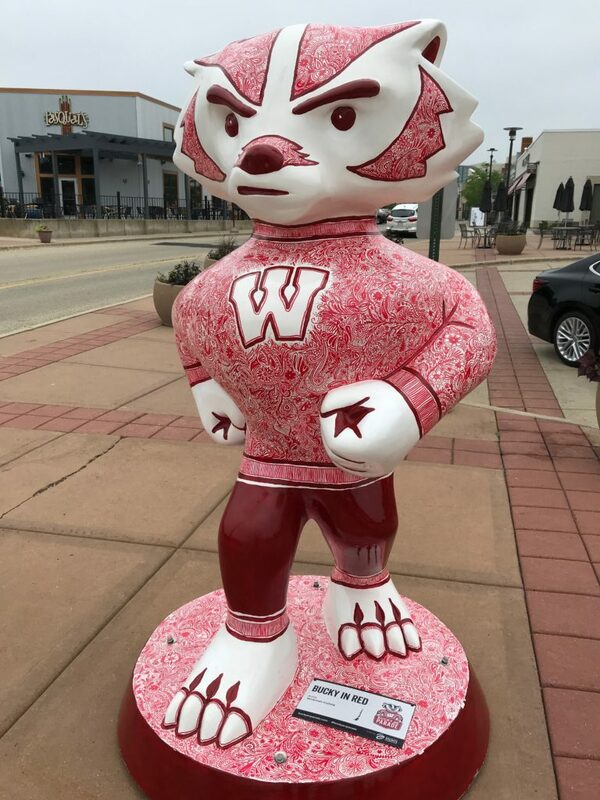 The “W” stamped on his chest features Bucky’s face, basketballs, footballs, hockey sticks and pucks. Ticket stubs lay strewn across his base. At Hilldale I captured “Jump Around Bucky” plastered with photos of fans at Camp Randall Stadium. 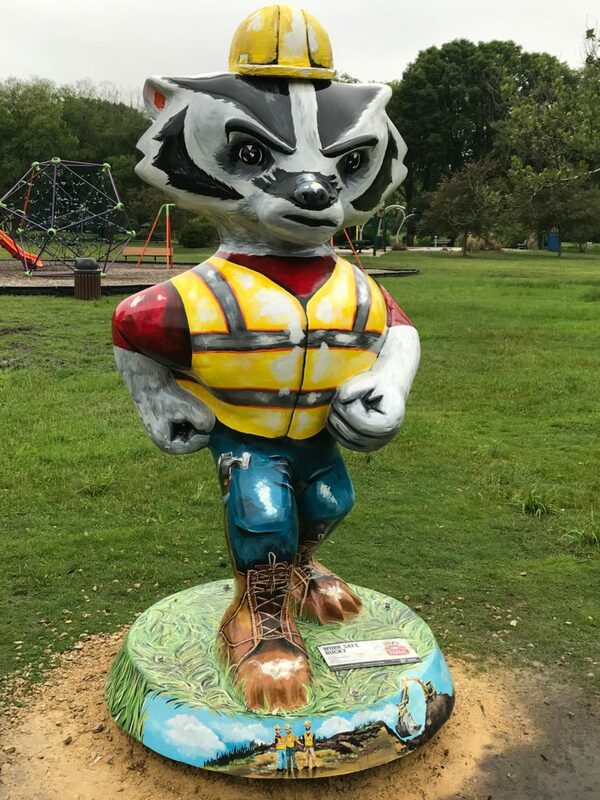 On my way home, I spotted the hardhat and yellow vest worn by “Work Safe Bucky,” inspired by the artist’s occupation. 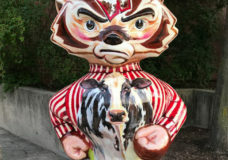 In order to inspect Bucky, I trudged through mud, dodged puddles and swatted mosquitos. great photos! Will you find Golden Bucky? I can’t wait to find out!